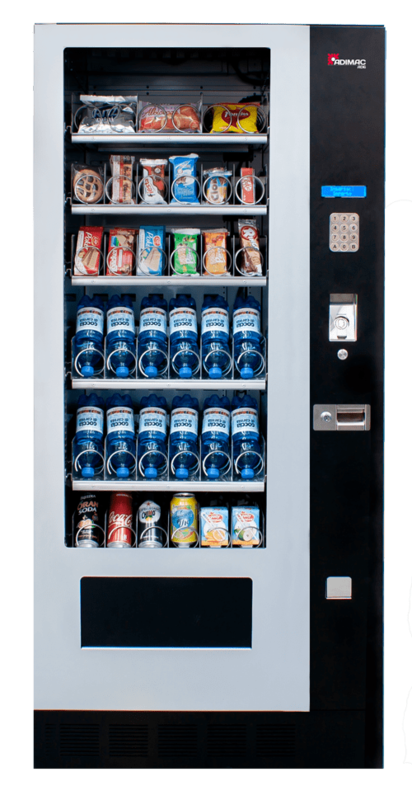 Automatic refrigerated Food Vending Machine for snacks and soft drinks with excellent load capacity. AD6 with its thousands of configuration possibilities is the most versatile solution in the Adimac range. Available also in the armored version. 6 trays holding up to 36 selections, it’s possible to add a 7th tray to increase the products variety. Many accessories to make the machine stronger in dangerous areas: anti-breakage protection for the glass, anti-vandalism coins insertion, antivandalism stainless steel side bars.